omnivore: noun; an animal or person that eats a variety of food of both plant and animal origin. See Mongo. It seemed fairly simple. Dad decided to add some kale to the greens. It was delicious. During apple season, Mongo is always on the lookout for fallen apples. Despite the fact that he has been stung on multiple occasions by yellow jackets hiding in the apples, he continues to scoop them up if he comes across a tasty one. This morning, Mongo had scored another apple from a tree near the house. He carried it back and then into the kitchen. Dad looked at him and asked, “Do you want to EAT?” EAT being one of Mongo;s favorite words, he opened his mouth, dropped the apple, and did a happy dance around the kitchen. Dad prepared his kibbles and green beans, and placed the bowl on the floor. Mongo scarfed it up with his usual gusto. Then he appeared puzzled for a moment as he surveyed the kitchen. When he saw the apple, he sauntered over and scooped it up again. Now Mongo knows apples are outside food. So he stood there in the kitchen with the apple in his mouth, looking at Dad expectantly. He was waiting for Dad to give the command “OUTSIDE”. Instead Dad threw him a curve ball. Mongo has a rubber orange Treat Ball. It is a hollow ball with an opening to the inside that allows Dad to put kibble into the middle of ball. As Mongo rolls the ball around, the ball meters out treats. Mongo LOVES Treat Ball. However, Mongo is way to good at the treat ball game. 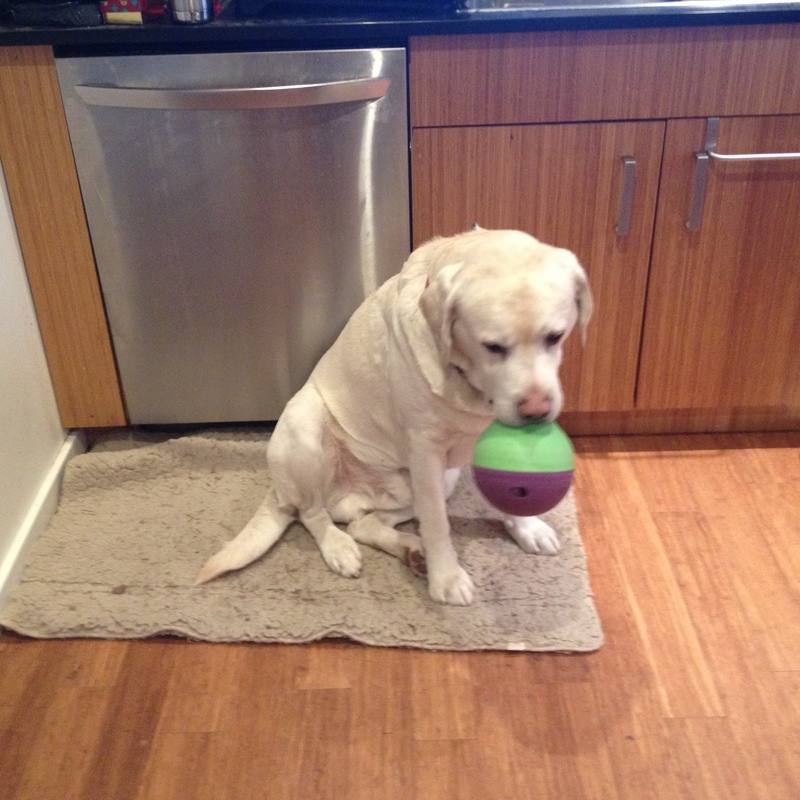 This means Mongo eats way too much kibble, and Dad spends all his time filling up treat ball. 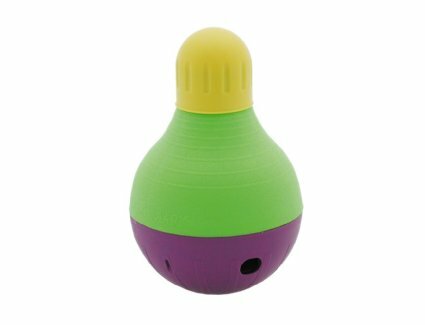 Treat Bobber has adjustments to slow down the number of treats it issues. And since it doesn’t roll as easily as a ball, it takes longer for Mongo to empty the Treat Bobber, theoretically at least. That theory does not assume that Mongo will learn how to make Treat Bobber roll down the driveway, thereby spewing treats all along its path. 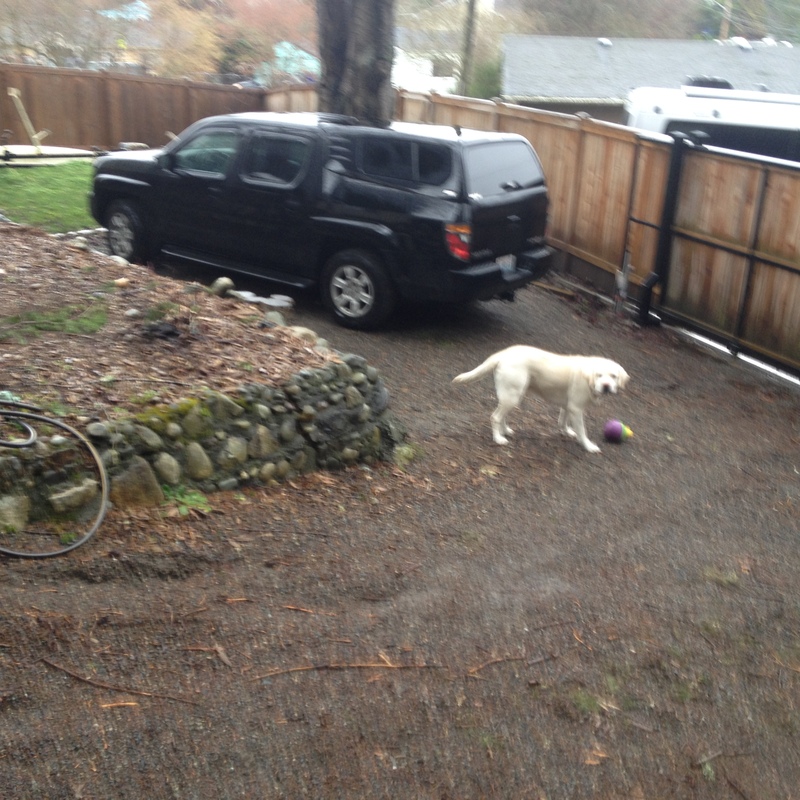 One or two trips down the driveway and Treat Bobber is empty. And then,when Mongo is done cleaning up after Treat Bobber, all he has to do is bring it back in to Dad for a refill.